The CNI-CB120SB Series is a self-contained temperature/process control panel that provides a complete control system design, eliminating the need to select, collect and assemble separate components. The preconfigured panels are ready to install, requiring only supply power, load and sensor hook-up. 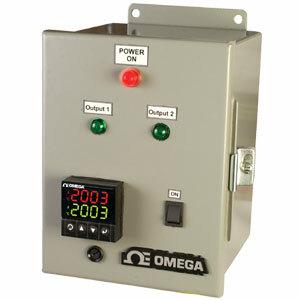 They are equipped with an OMEGA™ iSeries microprocessor-based controller with on/off, PID and ramp/soak capabilities along with a tri-color display. These control panels are supplied with a thermocouple input jack and M12 female connector for RTD or process inputs. Their compact packaging makes them portable or easy to mount, even in limited spaces. For additional information on the CNI microprocessor-based controller, see "related links" above. Not available for export to Canada or Europe. M12 field mountable 4-pin male connector with terminal lugs. Note: Comes complete with CNi16D33 controller ($245 value), one 1 A control fuse, one 15 A output fuse and two 5 A and 10 A fuses.